Many people want to hide under the covers after hearing the words “root canal” at the dentist’s office – but thankfully, the truth of the matter is much less scary. Root canal therapy is capable of restoring the health of badly infected and damaged teeth that would otherwise have to be removed from your smile. Better yet, the modern techniques and technologies we use here at Covina Family Dental help make this procedure no more uncomfortable than having a filling placed. To schedule a first appointment with Dr. Tran here in Covina, contact us today. Excessive oral sensitivity when eating foods that are hot or cold. Strong tenderness in a specific tooth when it’s touched or used to chew. Swollen gum tissue in a certain area of the mouth. The darkening/discoloration of a single tooth. If you are experiencing any of these symptoms on a regular basis, don’t wait to contact Dr. Tran. 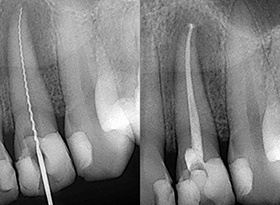 Root canal therapy may be capable of treating the infection and revitalizing the tooth’s livelihood. Our team will start by accessing the inside of your tooth with special instruments and removing infected pulp and harmful bacteria from within the canals. Then, after thoroughly cleaning the treated area, we will fill it with a biocompatible substitute for the pulp that’s called gutta-percha before sealing the structure. As a final touch, a custom-made dental crown or filling will be placed to rebuild the natural tooth’s shape, strength, and ability to function. 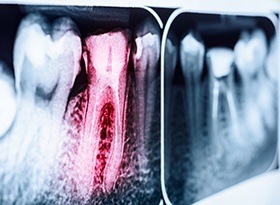 The pain that most patients associate with root canal therapy is actually the pain that’s caused by the dental inflammation and infection it’s treating. Following treatment, you may experience some mild discomfort that can be managed with painkillers or prescription medication.